You might think that little shoulder seam is insignificant, but it determines the fit of anything you wear on your upper body. Think of how coats, jackets, shirts, and dresses all hang from the shoulder. The shoulder seam has to fit right for the garment to look good and feel comfortable to wear. Try the sewing tips from Barbara Weiland listed below. 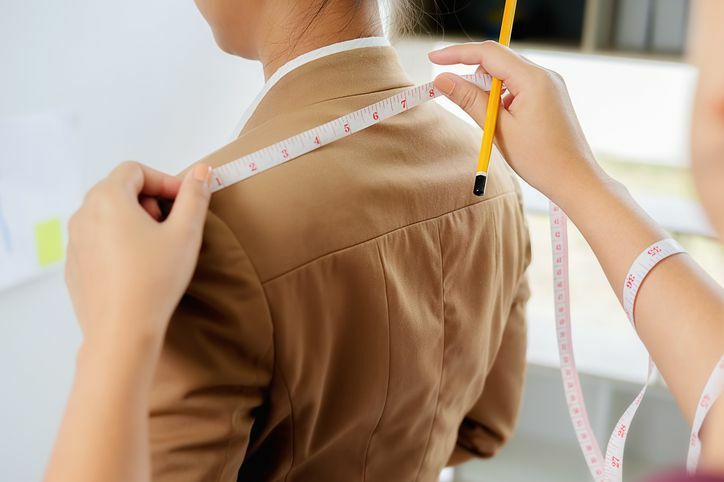 Fitted garments with set-in sleeves require the most precise adjustment. But even the looser fit of drop-shoulder seams or raglan or kimono sleeves will look better if they are adjusted for your shoulder width. You'll even feel more comfortable in sleeveless designs when you have the right shoulder adjustment. Let's look at the typical problems you will encounter with the fit of your shoulder seams. Garment Shoulder Too Narrow: If the garment shoulder is too narrow for your shoulder width, the armhole may bind, and the sleeve may ride up over the shoulder. Comfortable arm movement also will be restricted when your shoulders are wider than is expected by the pattern size. Garment Shoulder Too Wide: When your shoulders are narrower relative to the pattern size, you may see the sleeves hanging over the edge of your shoulder. Find a basic fit pattern offered by commercial pattern companies. Ask a sewing buddy to help take this measurement. Wear a chain necklace around your neck. It will sit at the base of your neck. Find the pivot point at your shoulder's edge. When you swing your arm back and forth, find the small indentation between the two bones at the shoulder edge. Mark it with a pencil or washable marker. Measure from the necklace at your neck base to the pivot point. Compare this measurement to the shoulder length on a basic fit pattern. The difference between your measurement and the pattern is the amount of adjustment you'll need in most patterns. You can adjust a pattern for a typical set-in sleeve by drawing a new seam line on the pattern tissue. You may want to use a French curve to ensure you have the right curve. To widen a pattern shoulder front and back, draw the new seam line at the armhole tapering from a wider point at the shoulder to the lower portion of the armhole. You may need to add some tissue paper to the pattern to allow for the cutting margin. To narrow a pattern shoulder front and back, draw a new seam line that is set in farther from the armhole and taper it to the lower portion of the armhole. For princess seams that begin at the shoulder, Barbara Weiland suggests letting the shoulder seam out or take it in at the princess seam. It's an easier fix for garments that are already finished. For cap sleeves, if you have very narrow shoulders you may need to extend the sleeve cap to fit into the adjusted armhole. It may be wise to cut the adjusted sleeve from muslin and test-fit it into the armhole.